The time is over for questions and wondering what all of this is about. Jesus has reached the final moment in his earthly life. Last week, we took a look at the last round of questions about the identity of Jesus. This week, his human life ends. I had a request for a Bible study to do in May, but I think I will go ahead and start it today. 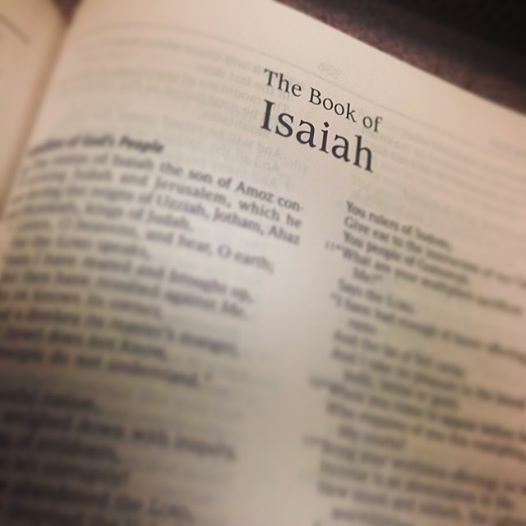 We will be starting the book of Isaiah. However, this will be a little different from the ones we have done in the past. Since Isaiah is 66 chapters long, we cannot take it one chapter at a time. We will be doing at least 2-3 chapters per post, in hopes we can get it done in May. So let’s pray that God opens our hearts to hear the words He has for us through this book. 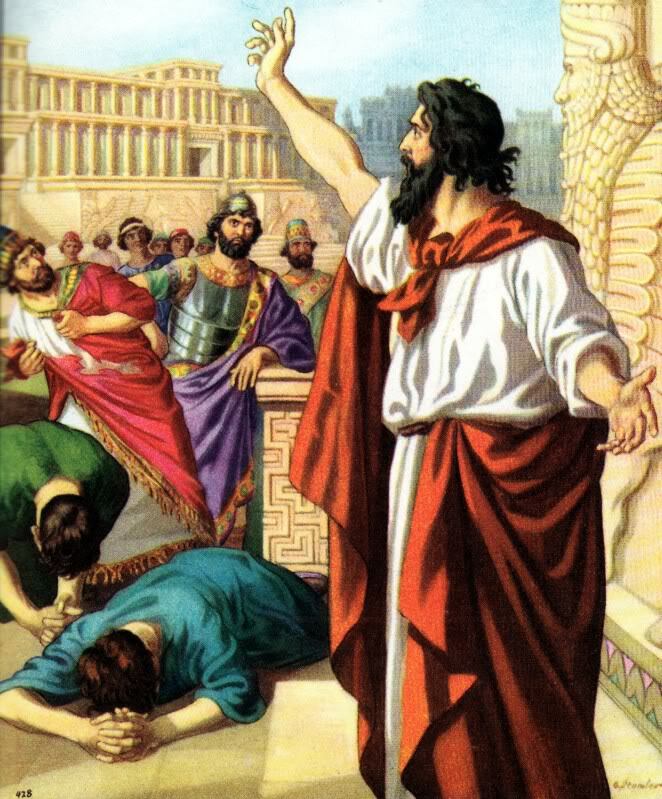 Isaiah’s ministry lasted through four different kings of Judah: Uzziah, Jotham, Ahaz, and Hezekiah. He spent his time teaching Judah the need to repent and turn back to God. He spoke about their faithlessness, and the coming judgment upon Judah. However, he also taught about a coming Messiah to save God’s people. So his messages of pain and destruction were also coupled with hope and salvation. Isaiah opens his book by describing the rebellious nature of the people of Judah and Jerusalem. God says to these people, “Even an ox knows its owner, and a donkey recognizes its master’s care — but Israel doesn’t know its master. My people don’t recognize my care for them.” (1:3, NLT) He is letting the people know how far they have turned. They have even gone so far that their worship has become a ritual by rote, rather than a meaningful expression to God. But God still offers the people of Judah hope, “Though your sins are like scarlet, I will make them as white as snow. Though they are red like crimson, I will make them as white as wool. If you will only obey me, you will have plenty to eat.” (1:18-19, NLT). Isaiah then begins to bring on the terror to come on the day of judgment, to those who do not come back to God. Isaiah writes “When the Lord rises to shake the earth, his enemies will crawl into holes in the ground. They will hide in caves in the rocks from the terror of the Lord and the glory of his majesty. On that day of judgment they will abandon the gold and silver idols they made for themselves to worship. They will leave their gods to the rodents and bats,” (2:19-20, NLT). The Lord than promises to make the people humble and realize their need for Him by saying, “[I] will take away from Jerusalem and Judah everything they depend on: every bit of bread and every drop of water,” (3:1-2, NLT). But God does promise a restoration for the people who survive. He promises to bring Israel back as a great people, with Him as their comfort and shelter (Isaiah 4). I think if we all set and think about it, the warnings found in these opening chapters not only apply to the world we live in now, but to some degree every society since Creation. We have all felt that the world is “going to hell in a hand basket” at one point or another. I say this because I don’t want anyone thinking, “Oh no! Our time sounds exactly like this!!!! !” While the promise and threat are very real, we live in a time where God has already given us our salvation. We simply need to accept it as our own. There will always be unbelievers driving the world in a direction contrary to the way Christ teaches us to be. They are even some believers that get it wrong (including me, I definitely am not the fore-most expert on the Will of God). But so long as we are not reading Scripture and praying, we are not following either. We know a few lines, and we think that is all we need. Honestly, that’s how we have some really bad teaching out there. To turn this and make it more personal, have you had a time when you have not sought God’s will for your life. Let’s be honest, I don’t think many of us are in that practice. I think most people (who are in the practice of prayer) are more of the mind “I’ll make the decision then ask God to bless it later.” The truth is that it works the opposite way of that. If we want to do our best, and make sure our life is in line with God’s will, we consult Him first then make the decision. Often times, I’ve found, He takes forever to get back with me. But I think it is to help us realize what we are about to do. In these open chapters of Isaiah, the people of Judah stopped consulting God. They did whatever they pleased. That can become us when we have the “do now, bless later” approach to running our lives. God promises us, “For I know the plans I have for you. They are plans for good and not for disaster, to give you a future and a hope.” (Jeremiah 29:11, NLT). I’d much rather choose a path that I can trust, and leads to good, than to forge my own path and lead myself into destruction. So we lift up our eyes to Heaven and says these words that the psalmist wrote, “I lift up my eyes to the hills — where does my help come from? My help comes from the Lord, the Maker of heaven and earth.” (Psalm 121:1-2, NIV). In today’s chapter we meet 3 of Israel’s judges. The first was Othniel who brought Israel out from the oppression by King Cushan-rishathaim of Aram-naharaim (talk about a hard name!). Othniel brought up an army and fought off the king, and brough Israel peace for 40 years. The next judge was Ehud, who fought against King Eglon of Moab. Eglon also had help from the Amalekites and Ammonites. Ehud fashioned a dagger and hid it on his body to assassinate Eglon. After he succeeded, he raised an army of his fellow Benjamites and fought off their enemies while they were still confused from losing their king. Ehud brought peace to Israel for 80 years. The third judge mentioned is Shamgar. Not much is said about him, other than he killed lots of Philistines (600!). God chose to test His people for two things; He wanted them to know how to fight (3:1) and to see if they would keep His commands (3:4). The first one is the one that surprised me. Why does God want His people to know how to fight? To find this answer I turned to one of my commentaries. The author made the point that God wanted His people to know how to wage war successfully like Joshua. This means that the point was for them to recognize that they needed God in order to succeed. The reason why the conquest of the Promised Land was successful was because Joshua trusted in God to go ahead of them and win the battle. This new generation of people in the Book of Judges has never known this. I’m sure there were many of them that thought the army under Joshua was simply very skilled. The truth is they weren’t. The conquest was the first time this group of people saw battle. But they knew to trust in God for success. This is still something that we struggle with today. We hear and learn that success is made by how much work we put into something. 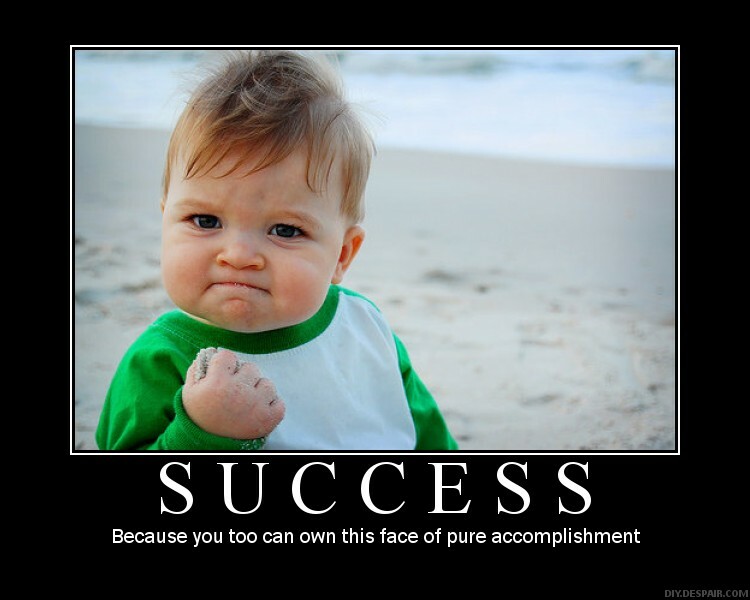 While this is still true, ultimately it is God that gives us our success. I have seen this play out in the worship ministry that I lead. I can practice as much as I want. I can put together a great set of songs. I can do all the work, but if I am not relying on God all of it can easily fall apart. God is the one we should be counting on. We should be going to Him before we make a decision, not pray to Him afterwards for blessing. He is our guide through life, not simply the giver of blessings. He knows what is right for us, and is there for us as our support. Paul wrote in his letter to the Romans, “If God is for us, who can ever be against us?” (Romans 8:31b, NLT). God will succeed. We have to trust that He will make the things within His Will successful. Give your plans to God. Any difficulty you have making a decision for your life or house, should ultimately be God’s to make. Only He knows what He wants for us. We have to be willing to submit to Him. Without Him we will fail. We need God to succeed. I was not feeling well yesterday, so I decided to put off my post for 1 Thessalonians 5. I try not to blog on Saturdays so that way I can spend time with my family. However, since my family is all in bed and I am wide awake, I thought I would write! As we finish up 1 Thessalonians, I find myself drawn to a few verses in the middle of this chapter. “Brothers and sisters, we urge you to warn those who are lazy. Encourage those who are timid. Take tender care of those who are weak. Be patient with everyone. See that no one pays back evil for evil, but always try to do good to each other and to all people. Always be joyful. Never stop praying. Be thankful in all circumstances, for this is God’s will for you who belong to Christ Jesus.” (5:14-18, NLT). This is a great call and reminder for how we are supposed to live our lives, but it is also a great reminder of how not to live. Paul’s first point is to not be lazy or timid. Being lazy keeps us from doing God’s work. Paul just reminded the church, “and to make it your ambition to lead a quiet life and attend to your own business and work with your hands, just as we commanded you,” (1 Thessalonians 4:11, NASB). Laziness is the exact opposite to what Paul believes we should be. We should be constantly working for the Will of God. But being timid is a hindrance to God’s work as well. Even if we aren’t lazy, timidity can cause us to not do as we are supposed to. Paul writes to Timothy, “For God has not given us a spirit of fear and timidity, but of power, love, and self-discipline.” (2 Timothy 1:7, NLT). If God has given us power, than what must timidity be? I believe that if it does not come from God, it must be from Satan. Therefore, if we are timid, that is the work of the Enemy attempting to stop the Will of God. As God’s children, it is our duty to always be after the same things as God, and so we must not be timid. Caring for those who are weaker and being patient with everyone is probably the hardest thing for me to do on this list. This is necessary because we cannot bring up strong believers if we do not care for the weaker ones and be patient with them. Everyone is weak when we first come to faith. Think of any well known believer and think of the faith they have. When they first came to faith, they knew nothing except for the love of God. Someone spoke into their lives and brought them up to where they are now. It is important for stronger Christians to come along side weaker Christians and help time rise to a place even greater than their mentor. I’m going to skip over the next point for a moment and move on praying. 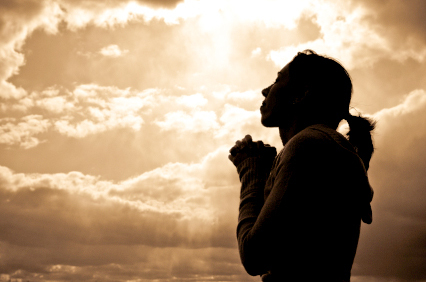 Prayer is an important part of the Christian lifestyle. It is our time to speak to God, and hear back from Him. I’ve been hearing a quote a lot here lately that I think needs to be shared. “Prayer is not monologue, but dialogue. God’s voice in response to mine is the most essential part.” (Andrew Murray). I think too many Christians view prayer as our time to give God our list of demands, what we think He should be doing in the world or for us. While it is important to tell God what is on your heart in prayer, it is even more important to have a conversation with Him and let Him guide you. The last point is that we should alway be joyously doing good, and be thankful no matter the situation. I can admit, sometimes I don’t want to do what is good, sometimes it’s just to hard. And sometimes I’m not happy about doing the right thing, but I should be. The right thing is always good and pleasing to God. When we recognize this, our hearts can sing because we are pleasing God and making Him smile! Unfortunately, the world doesn’t like what makes God happy. It seeks to remove God from here and most assuredly doesn’t want His Will to be done. For this reason, doing God’s Will can place us in unfortunate circumstances. We are reminded by Paul to be grateful, despite the circumstances, because if we are doing what we are supposed to, God is still happy even if we find ourselves in jail. The message we get from 1 Thessalonians is that God is not simply pleased by us “following the rules”. He wants us to completely follow Him, no matter what it takes. The Thessalonians were a church that never allowed itself to simply “do Church”, rather they excelled in doing the work God had for them and thus, “being Church”. What is God speaking to you? Have you not been completely His? I encourage you to spend time in prayer and seek out what He has for you. Being a Christian is a hard path, but our main goal is for Jesus to say “Well done”. We want Jesus to be proud of the work we have done, not simply tolerating. So get ready and be prepared for what God has in store for you, it will probably be hard, but I promise it is well worth it! In today’s ready we get a few glances into what is the matter with the church in Thessalonica. Until this point, Paul seems to be giving the church praise after praise, without addressing any issues within the church. In chapter 4 he speaks to them about living lives that are pleasing to God, and what is going to happen with believer who have died. The first point is what really grabbed my attention today. 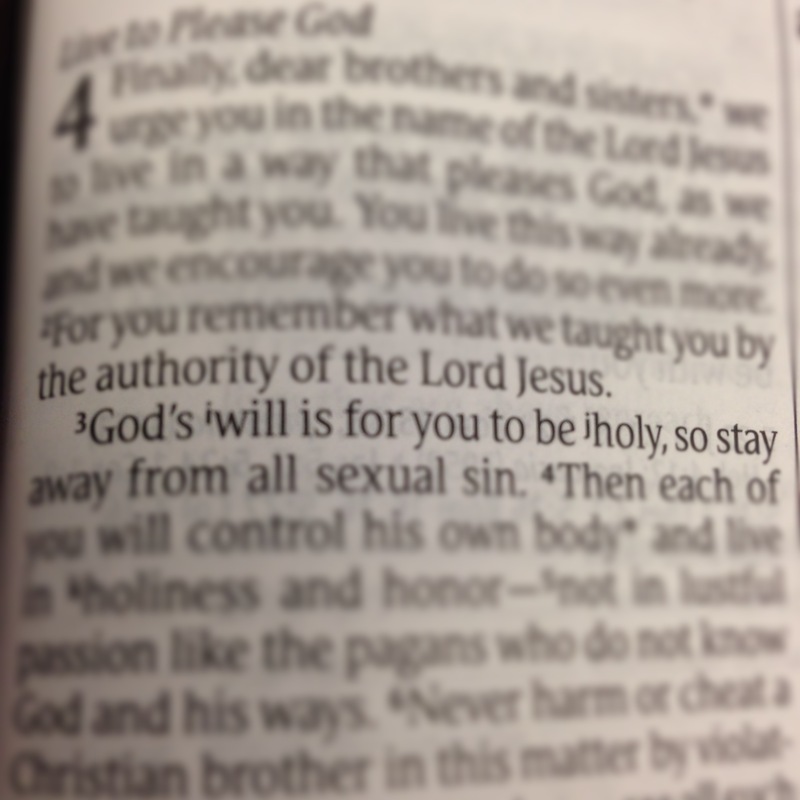 Paul defines this by saying, “God’s will is for you to be holy, so stay away from all sexual sin.” (4:3, NLT). I’m sure that the problem Paul is addressing is someone saying, “Since we’re saved from our sins, does it really matter if we keep on sinning?” This is a continuous problem in the early Church, since Paul addresses it frequently; most notably in Romans, “What sall we say then? Are we to continue to sin so that grace may increase? May it never be! How shall we who died to sin still live in it?” (Romans 6:1-2, NASB). Paul goes on (in Thessalonians) to mention not harming or cheating against others (4:6), and finishes this little section by saying, “Therefore, anyone who refused to live by these rules is not disobeying human teaching but is rejecting God, who gives his Holy Spirit to you.” (4:8, NLT). God’s desire is for us to be holy, but what does that mean? It sounds like a lot of rules that we must follow, but really it is more that that. The word that is being used here (hagiasmos) to describe holy means dedication to God, both in faithfulness to Him and in active service. It is a process, not an achievement. John Wesley describes grace in three parts: previenient, justifying, and sanctifying. That sanctifying grace comes to us after we have accepted Christ, and is what works within us to be holy. This understanding shows me that it is obvious that we cannot simply accept Christ and do nothing about it. There are obvious exceptions to this, one being the thief that accepted Christ while on the cross with him. Jesus said, “Truly I say to you, today you shall be with Me in Paradise.” (Luke 23:43 NASB). But for those of us that accept Christ long before we are on our deathbed, we are called to become holy, to be set apart for God and for God alone. This means we cannot sit idly by and do whatever we’d like. There’s are reason that “sinful nature” is also called “ways of the flesh”. Our natural status is for us to rebel against God. Paul tells us that if we work to become holy, we “will control [our] own body” (4:4, NLT). So to become holy is a path that we must forge, it is not something that just happens to us. Spend some time in prayer today. Figure out where that next move is on this trip to holiness.